St. Modwen's Ian Romano with Grupo Antolin's Laurie Johnson (at left) and Robin Hills at their new site. 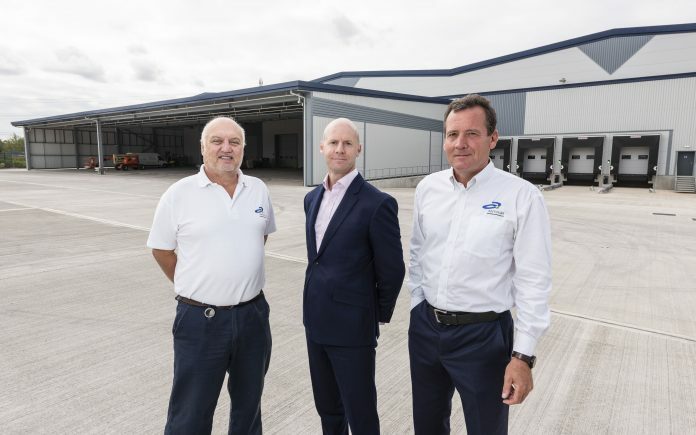 Developer and regeneration specialist St. Modwen has built a new bespoke manufacturing facility for global automotive manufacturing firm Grupo Antolin at its Barton Business Park development, near Burton-upon-Trent. Grupo Antolin is a 1st tier automotive supplier of interior trim systems and components to major original equipment manufacturers from multiple sites throughout the UK. It will service clients including Midlands-based Jaguar Land Rover out of the new 113,000 sq ft unit. St. Modwen delivered the unit specifically for the automotive company after the firm decided to expand its operations in Barton. Grupo Antolin originally joined the Business Park in 2007,taking up a 70,000 sq ft unit, which it has since outgrown. Since moving to the site, the Spanish company has created a significant number of jobs for local people, with further opportunities created by the development of the new unit. St. Modwen undertook a rapid build programme to ensure the automotive company could begin servicing their clients, with building work starting in October last year (2017). Ian Romano, Head of Commercial for the Midlands and North at St. Modwen, said: “Grupo Antolin has been a fantastic tenant at Barton Business Park for more than a decade and we’re pleased to have been able to accommodate their expansion, with a much larger unit, on a very tight timescale. Robin Hills, General Manager at Grupo Antolin, said:“Our Barton facility has won a number of new contracts and as a result we needed to extend our manufacturing footprint with this new facility, more than doubling the original floor space. Knight Frank advised St. Modwen on the letting. Cushman and Wakefield advised Grupo Antolin.